JANUARY 2009's extraordinary heatwave killed 374 Victorians, more than double the number of deaths in the Black Saturday bushfires. 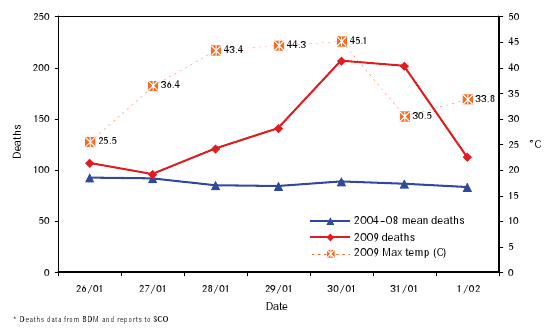 This report by the Chief Health Officer, Victoria, Australia provides an analysis of the health impacts of the January 2009 Victorian heatwave. This was a period during which Victoria experienced the most extreme temperatures, with many records set for high day and night time temperatures, as well as for the duration of extreme heat. Over the five days, 27-31 January 2009, maximum temperatures were 12-15°C above normal over much of Victoria. The temperature was above 43°C for three consecutive days from 28-30 January reaching a peak of 45.1°C on 30 January 2009. 374 excess deaths occurred in the week 26 January to 1 February, 2009 compared to the same period over the preceding 5 years. The majority, 294 excess deaths were of people aged 65 and over.